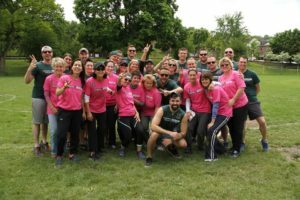 Stonewall Kickball – Pittsburgh brings together members of the LGBTQ+ community and our allies to play kickball on Sundays. It’s about more than just kickball; it’s about building a real community that interacts in a variety of settings, across age groups and genders. Kickball works great because it’s an easy sport to learn and requires minimal skill and physical ability. However it’s still very fun and great for friendly competition. Joining the league is a great way to make new groups of friends and give back to our community through league-sponsored fundraisers and charitable events! Whether you’re a veteran kickball player coming back for your seventh season, or a new player excited to see what everyone’s been talking about, make sure you register! Individuals can register as a team captain and invite people to join their team or as a free agent to sign up for a team of your choice or be placed on one after registration closes. When in doubt, sign up as a free agent to reserve your spot (anyone who pays in full before registration closes is guaranteed a spot in the league). Registration for the Spring Season opens February 23rd at 12PM!! If you are ready to join in all the fun for our 10th season!! Click here: SIGN UP NOW! !